When the world doesn't make sense, you work out. At least that’s Annie Ketcham’s remedy. As sales and marketing of the AMO (Associations Management Online) team, Annie works to help people understand AMO and answer the questions that may arise for new clients. Though she loves working with people, at the end of long day, she needs to unwind on her own time at the gym. Ketcham had a hard time deciding what she wanted to do while in college, changing majors three times while studying at St. Olaf in Northfield, Minnesota. She finally found a good fit for the time: exercise science. The program was heavy on the science, something for which St. Olaf is known. 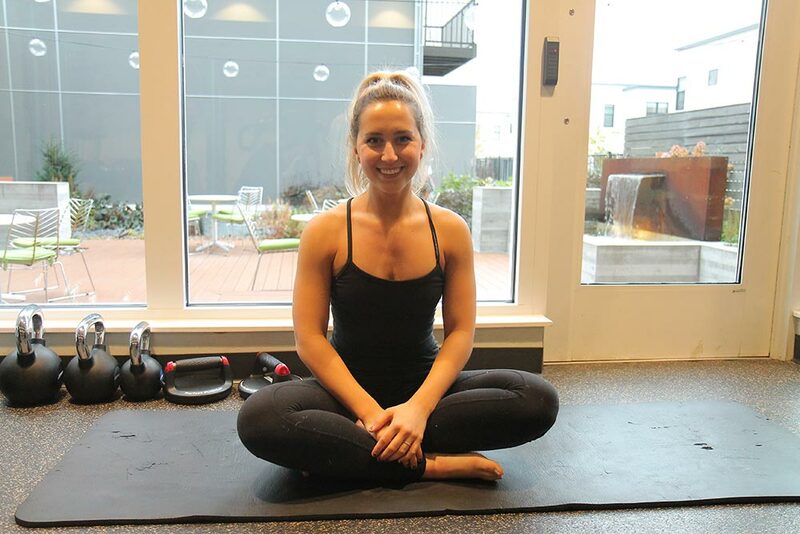 To complement her education, she found an internship at the Marsh, a center for balance and fitness in Minnetonka. There, she was able to help others improve their health while honing in on her love of exercise, something she has carried with her since a young girl. “I’ve loved being active since I could remember,” she shares while sitting in a gym in Uptown Minneapolis. “I started ‘working out’ when I was in sixth grade. I was a dancer and I played tennis. I did all of the sports until fifth grade, but decided to focus on those I liked most – tennis, dance and anything that got me outside. Through experience as a personal trainer and all around fitness enthusiast, Annie has seen the positive effects of physical activity. Endorphins are real, people. “I’ve actually seen the transition from someone being unhappy to happy because of exercise,” she continues. “Being a personal trainer for a year and a half, I worked with a lot of people who were starting from square one. Their attitude, how they approach life changes. Working out and exercise is basically committing to something that’s just for you. You need self-care." Self-care can lead to a balanced life and happiness, but what really is happiness? Does success contribute to happiness? Ketcham notes that though achieving goals can lead to small moments of happiness and elation, you need to remember you'll always come back to square one at some point. You should always be growing, always be progressing. Never stop being a student. If anything, it makes you really humble." “People who are more open to new experiences are so much more connected to their surroundings,” she observes. "That all plays into your happiness. The happiest people I know are the ones who are out there doing stuff. Whether it’s engaging with the community, or pushing themselves to do something that’s not their norm, challenging that status quo." With more and more people working long hours at the office, the one thing we cannot produce is time. So what is Annie’s recommendation to stay active on a busy day? “Lack of time is a horrible excuse to not be active,” she says. “I've worked with clients who have multiple jobs, responsibilities, those who are parents. But they make time to be active because it’s what they want to do. It’s all about what you want. If you really want to lift 200 pounds, run a marthonon or simply make exercise and your health a priority, you’re gonna make it happen. And don't be afraid to lean on others when you need accountability or a little motivation!" One strategy I like to use is to carve out time in your day like you’re carving out time for a work meeting. If the morning is a good time, instead of waking up at 6:30, wake up at 6 and start progressively adding it into your calendar. Do small increments. Do not go full force five days a week. It’s not sustainable, and you won’t like it. Do something you like. Fitness opportunities are endless these days. You can exercise in so many capacities. Long gone are the days of hours on the treadmill or boring weight machines. Move your body in a way that feels good and keeps you coming back for more."